"Anderson's Ohio Law of Professional Conduct" by Susan J. Becker, Jack A. Guttenberg et al. On February 1, 2007, the Ohio Rules of Professional Conduct replaced the Ohio Code of Professional Responsibility, a set of standards that had been in place since 1970. 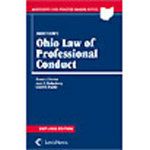 To reflect the new rules, Anderson's The Law of Professional Responsibility in Ohio has been revised by Susan J. Becker, Jack A. Guttenberg and Lloyd B. Snyder and reissued as Anderson's The Law of Professional Conduct in Ohio. The Ohio Rules of Professional Conduct depart from the prior Ohio Code of Professional Responsibility in many ways both large and small. This book describes the new standards. Becker, Susan J.; Guttenberg, Jack A.; and Snyder, Lloyd B., "Anderson's Ohio Law of Professional Conduct" (2007). Scholarship Collection. 15.